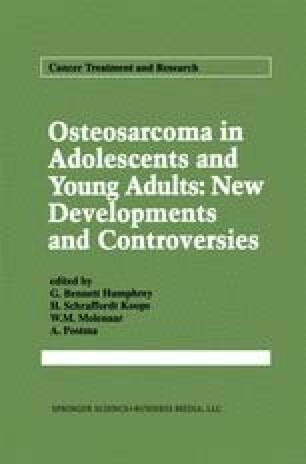 The Multi-institutional Osteosarcoma Study (MIOS) was initiated in June 1982 and was designed to test the role of adjuvant chemotherapy in the treatment of osteosarcoma of the extremity. At the time of initiation of this trial, the role of adjuvant chemotherapy in the treatment of osteosarcoma was controversial, because the outcome of patients treated with only surgery and without adjuvant chemotherapy appeared to be improving over time at certain institutions [1,2]. Preliminary  and updated  results of this trial have been published and have confirmed the favorable impact of adjuvant chemotherapy on event-free survival for patients with osteosarcoma of the extremity; the outcome for patients treated with immediate adjuvant chemotherapy was significantly better than for those treated with only surgery.